We’re excited to have a guest post today by Mary Savel from www.lucrativeleathercraft.com! Selling your leathergoods on Etsy is a great way to dip your toe into the world of online ecommerce for the first time. I say that mainly because Etsy is an easy-to-use ecommerce platform without the hassle of setting up and maintaining your own website. Of course there are many pros to selling your leathergoods on a self-managed website, but in this article we’re going to focus on how the beginner leathergoods seller can get found and sell their leathergoods on Etsy. Not only is Etsy a really user-friendly ecommerce platform but it also has some serious marketing muscle behind it. In the last year there were 34 million people who purchased something on Etsy. That’s roughly 2.8 million buyers per month! Etsy also invested $78 million last year in advertising with a purpose of attracting buyers to shop on Etsy. They plan on increasing this budget by 40% over the next year. Wow, that’s a lot of muscle! Another thing that makes Etsy a good selling platform is that Etsy doesn’t make money unless you make money. Granted they are implementing paid Plus and Premium plans in the next year, but they mainly make their money by taking a small percentage 3.5% (increasing to 5% in July 2018) of what you sell. That means, if you’re not successful, then they’re not successful. So it’s in their best interest to provide the best marketing tools and resources for you and your store in ensure that you succeed. All of this marketing muscle boils down to built-in traffic to your Etsy shop. Now that doesn’t mean that you can just sit back and put your feet up once you’ve published your listing. There are some key items that you need to include in your product listings in order to get noticed in the search results by those 34 million buyers. These are the top 4 things to consider if you want to put your best foot forward to create the best chance for success with your Etsy shop. And by success, I mean sales. To get in front of buyers, you need to have a descriptive and SEO-friendly product title. SEO means Search Engine Optimization and simply refers to making sure you’ve optimized your titles or chosen the best keywords so that Google can find your listing and show it to the user who is searching for your products. Having an optimized and descriptive title will help you get seen by both Etsy buyers and in the Google search results. To maximize your chances of getting found this way, use specific keywords and key phrases for your product instead of broad and vague phrases. Also steer clear of using collection names that most people wouldn’t necessarily be searching for or know about. Another thing that will get you placed higher in the search results is if you put the most important and descriptive keywords first in the title. You can also use events in your title if it applies, like birthday gift, wedding gift, father’s day, etc. Etsy allows you to use 140 characters for your title, so use them wisely by choosing specific keywords and phrases that you think your customer might be searching for. For example, let’s say you have a leather wallet collection for men that comes with a monogram and it’s from your Henly Scot collection (Henly Scot was your sweet old grandfather and this collection of heritage wallets is a tribute to him). So you create a product listing title like this: Henly Scot monogrammed leather wallet. But most people are not going to know about your sweet grandpa nor be searching for him. You’ve also left the most important descriptor, the wallet, all the way at the end. One of the biggest things that sellers often forget is that your customer who is buying online can’t feel or touch your product so they’re relying solely on a product description that captures what this item is like in person. State the obvious about your product because it might actually not be so obvious to someone who has just come across your product for the very first time. Use key phrases here as well as this help you to rank higher in Google search results. The very first sentence of your description should be the most descriptive and important one. This is both what your shopper will read first and it’s also what will display first in the Google search results window. 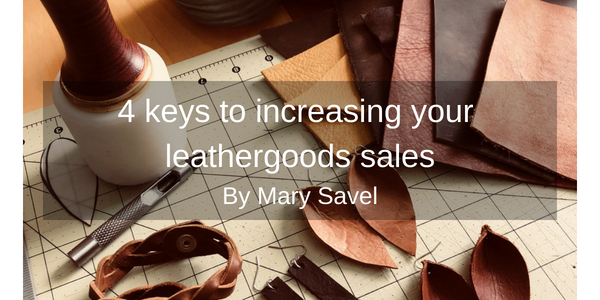 If you know your customer well, you should be able to craft a specific message and tap into any pain points that your leathergoods might be solving or anticipate and speak to any objections to buying that your customer might have. A guarantee, free returns or the hardwearing method that you used to create the item could be the thing that persuades your budget-conscious customer to go ahead and purchase. So make sure you know your customer, as well as what they value and what they don’t value, and then craft a description around that. Product tagging is another tool that Etsy offers to sellers that is super important if you want to be found by buyers. For best results, use multi-word tags to narrow down and get more specific about what your buyer might be searching for. So instead of tagging “wallet” and “men’s”, tag it as “men’s wallet” or instead of “veg tan” and “wallet” use “veg tan wallet” as a tag. Etsy allows you to use 13 tags so use them all to maximize your chances of getting seen and keep your most important and descriptive tags to the front. If you’re still not sure how you should be tagging and need some ideas, do some tagging research. Type descriptive phases into the Etsy search bar for your item. Like Google, there will be a drop down that appears that gives you other popular search terms that people are using to find items like the one that you’ve typed into the search. Use these new tags and see how they perform. Buyer’s search terms that appear in both the title and tag will be ranked higher by the Etsy algorithm than if the search term is just in the title or just in the tag. Tagging is not a perfect science, so make sure you’re checking your Etsy insights and reports often to see what is working and what is not. Keep using what is working and lose what isn’t. Etsy has an algorithm that essentially rewards sellers by placing them in the search results more often if they have good customer engagement. They call this Etsy Listing Quality. Etsy is looking for products that have been purchased, favorited or even just clicked on. These actions on your listing will raise your Etsy Listing Quality score and help to boost your shop in the search results. So at the very least, encourage shoppers to click through your listing and photos to have a closer look. This small step, even if your customer doesn’t buy, will help to increase your user engagement score and register with the algorithm. Whether you choose to sell on Etsy or your own website, getting your products online is just the tip of the iceberg when it comes to creating a sustainable leathergoods business. There is so much that happens before that point and afterwards to sustain sales. Having a process in place for developing your product and launching it, marketing methods and finding your ideal customer and sales strategies are just a few of the most important things that you should be spending time on in your business. Keeping track of all of these things can be a little overwhelming so I’ve created a checklist that walks you through start to finish, my own pre-launch to post-launch strategy for how I launch and sell my leathergoods. Download your copy of the checklist at www.LucrativeLeathercraft.com and get started selling your leathergoods for what they’re worth. BIO: Mary Savel teaches people how to make traditional leatherwork and how to sell their handmade work online, at craft fairs and to stores. She runs www.LeatherBeast.com, www.MarySavel.com, and lives and works out of her NYC apt that she shares with 1 boyfriend and 2 cats. Your article was very informative. This will be very good information for when I start selling on Etsy later this year. Can you give someone new to selling their work some insight as to how to know their customers better? I mean how do you know what your focus should be if you have not sold anything yet. Oddly perfect timing with this article being the email of the day. I just did photos of some inventory last night for creating our Etsy shop. Even though I have a fully operational e-commerce website, I thought adding the Etsy store option for non-custom work that has been sitting in stock for a while as being a good plan to get it moving. We’re so glad the article was helpful and in perfect timing! Thank you for the comment! Hey that’s great idea! I’d love to know how it goes! Mary – I’ve sold one item from the Etsy shop. I’m seeing some drive-by traffic in from the site statistics, however none are pulling the trigger. I haven’t put a lot in to the Etsy shop, so it’s all on me for not seeing the sales. The fee structures are a bit confusing. I seem to be getting charged on a monthly basis for listings that I put up in previous months. But that’s not what we’re here for – this is all about leatherwork! thank you for your comments. Most timely!